Did you take ice skating lessons when you were younger? Maybe you stopped because of financial resons, or possibly logistics. Whatever the reason, you never realized your aspirations . You are among thousands of adults wanting to return to your childhood passion, figure skating. You now have the time and financial capability to explore activities that you always wanted to when you were a kid. Welcome back to figure skating! 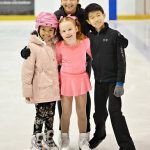 As a figure skating coach I embrace adults who want to get re-introduced to the sport. Let me assure you that you are a welcome change from ice skating classes full of six year olds! You are interested in learning, enthusiastic and willing to try. Come on into the ice rink and try group or private lessons. Most rinks offer adult classes, which I recommend as a great place to start. If you want a more personalized approach, look for a private figure skating coach. It’s never too late to learn! See you on the ice. « What Are Your Personal Goals for Figure Skating?